Outdoor Umbrella or Shade Sail? There are many different types of shade, the main two used here in North America being either fixed shade sails or cantilever outdoor umbrellas. Here are the main differences between the two, which will help you decide which option would work best for you. A shade sail is fixed in one space, with several anchor points. Requires posts or a fixture such as a bracket on the side of a house, fence, or independent pole system to be bolted to. A Shade sail is a permanent type of shade protection. It is usually installed by the manufacturer, and not usually taken down – an all year around shade option. Often if it does need to be taken down it will require some expert help to remove and then again to re-install. All shade sails should be made out of UV stabilised fabric – normally a knitted shade cloth or PVC is used, with stainless steel edging cable and eyelets to fix the sail. Custom fitted – usually designed on a case by case basis to fit the area it’s needed for. The cantilever outdoor umbrella is attached to a free standing pole at one side (as opposed to the centre pole umbrella we are used to seeing). This means there is no pole to get in the way of tables, seating or other outdoor equipment. 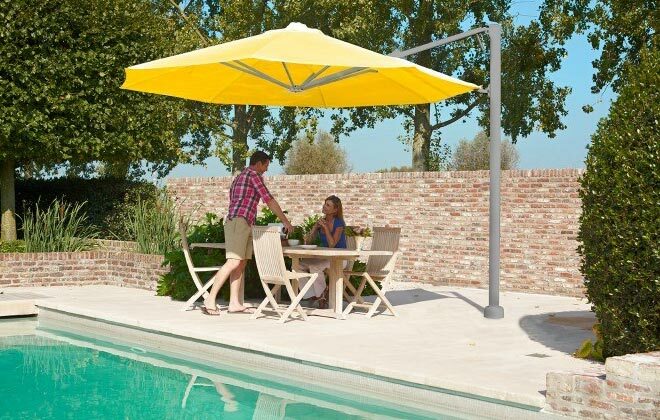 The cantilever umbrella tilts and rotates on its pivot base to block the sun all day without having to completely cover the whole area. You can get multiple umbrella canopies on one post (see image below) to cover a larger area or for more flexibility. A cantilever umbrella can be attached to a wall and then tilted and positioned for all day cover. 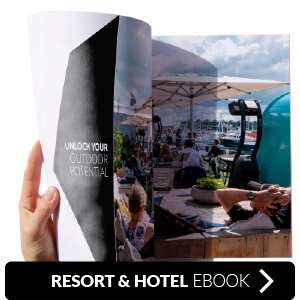 Made from fade resistant marine grade UV stabilised fabric, like Sunbrella acrylic. Ideal for use in the sunny states and places with high UV penetration. 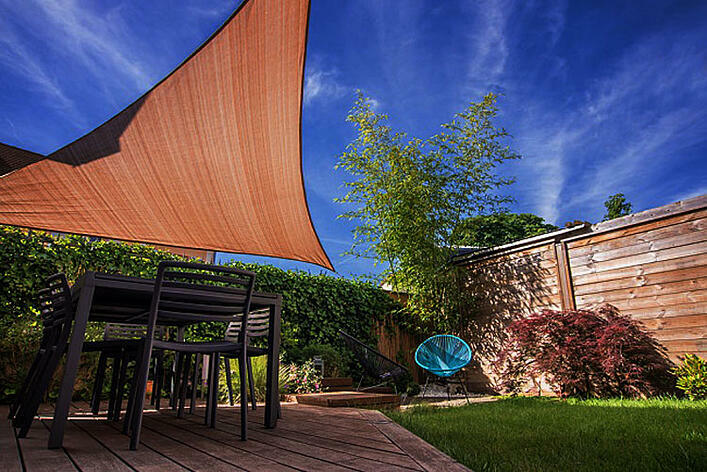 What are the main differences between a shade sail and an outdoor umbrella? The key point of difference is the overall coverage. A shade sail may be more spread out (depending on the size) so it can cover more area but it is entirely dependent on the angle of the sun. Umbrellas however, can be independently adjusted and moved around to shield different angles of the sun, especially with a cantilever umbrella on a portable base (as opposed to wall fitted). The second is the appearance. Outdoor umbrellas and shade sails both come in a variety of colours, so you can match your colour to suit the outdoor setting. Shade sails are normally custom fitted and can look good when sufficient thought, time and money is invested to install them properly. 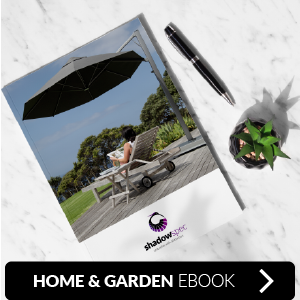 Outdoor umbrellas look great, can usually be installed yourself and are designed as an accessory to compliment your outdoor space, which means that there are a wide range of options to choose from. With regards to flexibility, cantilever umbrellas are much easier to re-position to follow the sun, you can’t easily disassemble or re-angle a shade sail and often will need the installers to be involved. Shade Sails and Outdoor Umbrellas are both viable options for a shade covering; it is mostly dependant on your space and what you are covering. Both will protect your skin from the heat of sun and provide protection from harmful UV rays. Regardless of whether you have a small or large amount of space to cover, you will be able to find a solution on our website. However, if you're not sure which options would suit you best, our team of experienced staff can run you through our collections and help you decide which model would be most appropriate according to your space, function and style.